Home Amazing Lights AyalaLand christmas Evoliving Holiday Season Lights Magical Field of Lights nuvali Nuvali Magical Field of Lights park photos Sounds of Lights Sta. Rosa Laguna Visit Nuvali The launch of “Magical Field of Lights” at Nuvali! The launch of “Magical Field of Lights” at Nuvali! 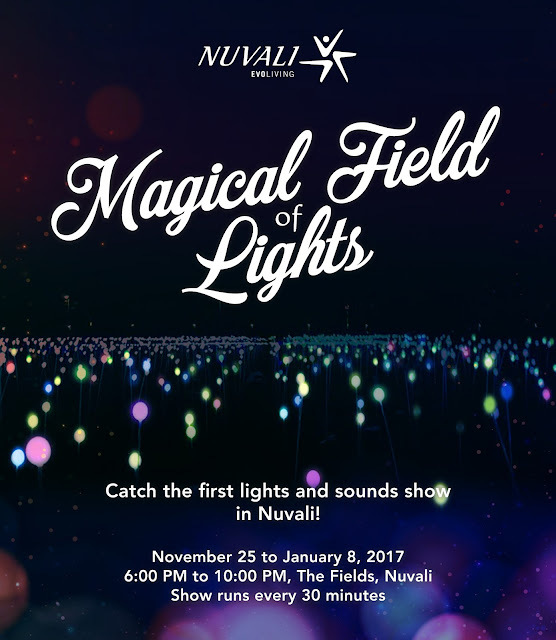 Nuvali transforms into a first-of-its-kind destination with the launch of “Magical Field of Lights,” this holiday season. Nuvali celebrates Christmas with its first lights and sounds show and much more in Ayala Land’s largest sustainable estate. The “Magical Field of Lights” is ongoing until January 8, 2017, Nuvali’s grass fields light up like an enchanted field of tulips dancing to two 5-minute medleys enjoyable for the whole family. The show will run every 30 minutes from 6:00 P.M. to 10:00 P.M. daily. Aside from the show, the field also features a variety of attractions such as the 50-meter long light tunnel, Christmas trees, and dandelion light installation. It will also be complemented with a Christmas fair that showcases traditional Filipino Christmas treats such as bibingka and puto bumbong. A variety of local goods perfect for gift-giving will also be available. Nuvali is located in the cities of Sta. Rosa, Calamba and Cabuyao in Laguna and features a diverse mix of residential and commercial developments.